Netfllix has always been an extremely progressive company. I know the founders, Marc Randolph and Reed Hastings well, and many of the employees too. There is an amazing amount of brainpower behind the scenes there and it shows with their great products and great story. I read with interest Larry Dignan’s piece about their usage of Amazon Web Services to move key parts of the Netflix infrastructure into the Cloud. It doesn’t seem that long since I remember being asked to visit Netflix and tell them about my company’s experience moving into the Amazon Cloud. I expected to meet in Reed Hasting’s office with perhaps a couple of people, but was surprised to find they had assembled a small auditorium of developers to hear the story. I spent a little over an hour telling them how we’d done it and answering questions and then went away. As an aside, this is how smart companies go to school–by sharing information broadly rather than hoarding it at the top, and by bringing in outsiders who can add to the collective knowledge pool. When was the last time your company did something like this? It’s so easy here in Silicon Valley, which is dense with sharp insights and hard-won experience. Take advantage of it, it’s the least you can do after paying the high cost of living here! I admit, I wondered whether they’d carry it off or even get started, or whether they were just curious. Moving to the Cloud is a big step for a big thriving company. There are a lot of moving parts that have to be orchestrated for it to be successful. But as I said, they are an extremely progressive company with a lot of very bright people. Color me very impressed with the speed at which they were able to move. PS Amazon has a press release / case study with more detail on just what Netflix is doing. Well it’s official. My company, Helpstream, has now been running our application entirely on Amazon Web Services for a week and we’re very happy with the result–it’s better, faster, and cheaper. We’ve gotten a more robust system for our multitenant SaaS application that’s actually cheaper and easier for us. Customers are reporting that the application even seems faster than it had been. The effort involved was not too bad, though we did go through a multi-stage process before committing everything to Amazon. I’ve chronicled that process on our corporate blog if you’re interested in seeing how such transitions are done. Meanwhile, I can’t imagine why startups are fooling around with their own data centers. Easy for me to say, we were too just one short week ago! But seriously folks, given the current economy and the fact that you can deliver a better service more easily and cheaply with Amazon, why wouldn’t you make that a high priority? I remember sitting in our weekly staff meeting with my Products organization discussing how to phase the transition. We’ve got quite a lot of business activity on the horizon, as well as over 120 customers using the service at present. I was arguing for more baby steps and my fear that we might screw something up. My Director of Operations made the statement that when he looked at Amazon versus the sort of datacenter a startup can run, he couldn’t understand how we could afford to wait any longer than we had to. What he meant was that the capabilities of AWS were not something we could even begin to approach any time soon. When we took a careful look at what we were afraid of happening in a move, it turned out there was a strategy to mitigate every single risk. So, we put together our migration plan and got on with it. Boy were we happy we did! Wow, what an exciting time to be watching the Amazon Cloud Platform evolve. We’re just beginning to think through the recent SimpleDB announcement when Amazon launches DevPay. Lucid Era CEO Ken Rudin says land grabs are all about a race to the top of the mountain to plant your flag there first. It seems like Amazon has hired a helicopter in the quest to get there first. Google, Yahoo, and others are barely talking about their cloud platforms and here is Amazon with new developments piling up on each other. And unlike some of the developments announced by companies like Google, this stuff is ready to go. They’re not just talking about it. What’s DevPay all about, anyway? Simply put, Amazon are providing a service to automate your billing. If you use their web services to offer a service of your own, it gives you the ability to let Amazon deal with billing for you. It’s based off the pricing model for the rest of the Amazon Web Services like EC2 and S3, but you can use any combination of one-time charges, recurring monthly charges, and metered Amazon Web Service usage. You have total flexibility to price your applications either higher or lower than your AWS usage. In addition, they’re promising to put everything they know about how to do e-commerce (and who knows more than Amazon?) behind making the user experience great for your customers and you. It’s not a tremendous big step forward, but it’s useful. It’s another brick in the wall. There are companies out there providing SaaS infrastructure for whom billing is a big piece of their offering, so obviously it is a problem that people care about having solved. What are the pros and cons of this particular approach? Let’s start with the pros. If you are going to use Amazon Web Services anyway, DevPay makes the process dead simple for you to get paid for your service. It’s ideal for microISV’s as a way to monetize their creations. The potential is there for interesting revenue that’s tied to usage in the classic SaaS way. What about the cons? Here there are many, depending on what sort of business you are in and how you want to be percieved by customers. I break it down into two major concerns: flexibility and branding. Let’s start with branding, which I think is the more important concern. It’s not clear to me from the announcement how you would go about disassociating your offering from Amazon so that it becomes your stand alone brand. You and your customers are going to have to acknowledge and accept that the offering you provide is part of the Amazon collective. Resistance is futile. This is the moral equivalent of not being able to accept a credit card directly, and instead having to refer customers to PayPal. It works, but it detracts a from your “big time” image. If having a big time stand-alone image is important for you, DevPay is a non-starter at this stage. It’s not clear to me that Amazon would have to keep it that way for all time, but perhaps they need to protect their own image as well, and would insist on it. Second major problem is flexibility. Yes, Amazon says you can “use any combination of one-time charges, recurring monthly charges, and metered Amazon Web Service usage”. That sounds flexible, but it casts your business in light of what resources it consumes on Amazon. Suppose you want a completely different metric? Perhaps you have another expense that is not well correlated with Amazon of some kind that has to be built in, for example. Perhaps you need to do something completely arbitrary. It doesn’t look to me like Amazon can facilitate that at the present. Both of these limitations are things Amazon could choose to clean up. So far, the impression one gets is that Amazon is just putting a pretty face on the considerable internal resources they’ve developed for their primary business and making them available. What will be interesting is to see what happens when (and if) Amazon is prepared to add value in ways that never mattered to their core business. Meanwhile, they’re doing a great job stealing a march on potential competition. As a SaaS business, they should be quite sticky. Anyone that writes for their platform will have a fair amount of work to back out and try another platform. DevPay is another example. It will create network lock-in by tying your customer’s business relationship in terms of billing and payment to Amazon, and in turn tying that to your use of Amazon Web Services. For example, that same lack of flexibility might prevent you from migrating your S3 or EC2 usages to, say, Google. There doesn’t look to be a way for you to build the Google costs into your billing in a flexible way. We’ll see the next 5 to 10 years be a rich period of innovation and transition to Cloud Computing Platforms. Just as many of the original PC OS platforms disappeared (CP/M anyone?) after an initial flurry of activity, and others have changed radically in importance (it no longers matters whether you run PC or Mac does it? ), so too will there be dramatic changes here. The beneficiaries will be users as well as the platform vendors, but it’s going to take nimbleness and prescient thinking to place all your bets exactly right. The good news is the cost of making a mistake is far less than it had been in the era of building your own datacenters! Ever hear of a fabless chip company? This is a company that sells Integrated Circuits but owns no manufacturing facilities. They just write software, in effect, and send it out to someone else’s fab. Brilliant. Many kinds of manufacturers often do the same. After all, manufacturing may not be the distinctive competency of a company, or the company may achieve better economies of scale by using centralized manufacturing owned by much large companies. This is starting to happen big time with web software. IBM just announced they’re going to join Amazon in the cloud computing business with “Blue Cloud”. Companies will be able to buy capacity in someone else’s cloud which they sell as their own. No need to own any hardware or even visit a colo center. Why would you want to own a datacenter if you didn’t have to? Why would you think you can do it as well as Amazon or IBM? Many others including Yahoo, Google, and Microsoft will be a part of this future. Sun is already there with Sun Grid. So far, the formulas are pretty similar. IBM and Amazon are both Linux-based systems built on virtualization software. At some point, if enough hardware capacity is locked up in this rental data centers, it will become an important sales channel for all server hardware manufacturers. Take Dell for example. They’ve always sold direct. Shouldn’t they consider this kind of business, especially when other hardware companies are going there? What about HP? Look at it as a way for hardware makers to switch from the equivalent of perpetual licensing to the SaaS rental model. What about Microsoft? Can .NET be as successful if they don’t build a Cloud Computing Service that is .NET based? Seems to me this is a strategic imperative for the OS crowd lest Linux steal the show. Sun is already there with Solaris on Sun Grid. This is the system my old alma mater Callidus Software uses to host their SaaS solution and it works well. IBM is not missing the chance to offer PowerPC as well as x86 servers for Blue Cloud. IBM is also partnering with Google around Cloud Computing, so there may be all sorts of interesting bedfellows before this new paradigm is done rolling out. A great example that’s being written about by Scoble and others is Mogulus. CEO Max Haot says they don’t own a single server, it’s all being done on Amazon, and yet they’re serving live video channels to 15,000 people with just over $1M in funding. You’ve got to love it! A number of other serverless and near serverless companies commented on Scoble’s post if you want to see more. These big guys are not the only ones in the business. Certainly companies like OpSource and Rackspace count too. 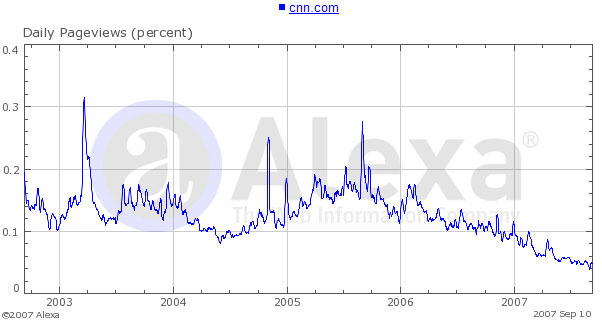 This is traffic for cnn.com. Notice how spikey it is? Those are some big spikes. If you web service hits one, you must either have a ton of extra servers on tap, or deal with your site getting painfully slow or going down altogether. With a utility computing or grid service such as Amazon EC2, you can provision new servers on 10 minutes notice, use them until the load goes away, and then quit paying for them. Payment is in 1 hour increments. I know a SaaS vendor whose load doubles predictably one week out of every month because of what his app does. He owns twice the servers to handle this peak. He’s growing fast enough at the moment that he doesn’t sweat it much, but at some point, he could really benefit by flexing capacity. Now let’s talk about downsides. First, most software doesn’t just run unchanged on these utility grids. Even if it did, most software isn’t written to dynamically vary it’s use of servers. Adding servers requires some manual rejiggering. Amazon has a particularly difficult pitfall: you have to write your software to deal with a server going down without warning and losing all it’s data. In fairness, you should have written your software to handle that anyway because it could happen that you whole machine is toast, but most companies don’t start out writing software that way. There are companies, Elastra is one, that purport to have solutions to these problems. Elastra has a MySQL solution that uses Amazon’s fabulously bulletproof S3 as it’s file system. The second issue isn’t so much a downside really. We can’t blame these services for it at any rate. What I’m talking about is automation. To really take advantage here you need to radically increase your automation levels. I recently saw a demo of some new 3Tera capabilities that I’ll be writing about that help a lot here. The bottom line? You’re missing out if you’re not exploring utility computing: it can save you a bundle and make life a lot easier. The subtext is that there are also a lot of new technologies, vendors, and partnerships coming down the pipe to help maximize the benefits. Nick Carr picks up the theme. One of the commenters raises an excellent point. Using an IBM or Amazon gives peace of mind to customers of small startups. Amazon has just announced two new instance types for their EC2 utility computing service. The original type will continue to be available as the “small” type. The “large” type has four times the CPU, RAM, and Disk Storage, while the “extra large” has eight times the CPU, RAM, and Disk. The large and extra large also sport 64 bit cpus. Supersize your EC2! Why do this? Because the original small instance was a tad lightweight for database activity with just 1.7GB of RAM while the extra large at 15GB is about right. Imagine a cluster of the extra large instances running memcached and you can see how this going to dramatically improve the possibilities for hosting large sites. One of the neat things about this new announcement is pricing. They’ve basically linearly scaled pricing. Whereas a small instance costs 10 cents per instance hour, the extra large has 8x the capacity and costs 8×10 cents or 80 cents per hour. What’s next? These new instances open a lot of possibilities, but Amazon still doesn’t have painless persistence for databases like mySQL. If you are running mySQL on an extra large instance and the server goes down for whatever reason, all the data on it is lost and you have to rebuild a new machine around some form of hot backup or failover. That exercise has been left to the user. It’s doable: you have to solve the problem in any data center of what you plan to do if the disk totally crashes and no data can be recovered. However, folks have been vocally requesting a better solution from Amazon where the data doesn’t go away and the machine can be rebooted intact. I was told by the EC2 folks at the Startup Project to expect 3 announcements before the end of the year that were related. I’m guessing this is the first such announcement and two more will follow. There’s tremendous excitement right now around these kinds of offerings. They virtualize the data center to reduce the cost and complexity of setting up the infrastructure to do web software. They allow you to flex capacity up or down and pay as you go. Amazon is not the only such option. I’ll be reporting on some others shortly. It’s hard to see how it makes sense to build your own data center without the aid of one of these services any more.